Bethesda, MD -- The scene is awfully familiar: a Baltimore Redbirds team that battles all the way back after an early loss in the Cal Ripken League Championship Series meets the Bethesda Big Train in Friday night’s Championship Game. So familiar, actually, that Friday night marked the third consecutive year that the two teams met in the finals. 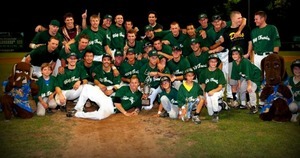 And for the third consecutive year, despite another closely contested ballgame, the Big Train took home the trophy. Michael Aldrete (San Jose State), who entered Friday night’s game having gone 4-for-6 with four runs scored in the LCS, connected for a two-run home run to left-centerfield in the seventh inning to give the Big Train a 4-2 lead that they never relinquished. Aldrete (who also earned a save in Thursday night’s 5-4 victory) was named the LCS Most Valuable Player for his heroics. The Big Train struck first when Adam Barry (Cal State Northridge) singled home Landon Appling (Houston) in the first inning. Appling had two hits in the ballgame. The Redbirds tied it in the fourth when Cory Jensen (Florida Southern) singled and eventually scored on an errant throw by the catcher down to third base. Bethesda went back ahead in the bottom of the fourth on a sacrifice fly by Brennan Middleton (Tulane), but the Redbirds answered the next inning when Ben Winter (Towson) doubled home Jack Carey (Wake Forest), who had walked to lead off the inning. Kelly Secrest (UNC Wilmington) started for the Big Train and struck out seven batters in five innings but it was David Wayne Russo (San Jose State) who was in the game for Bethesda when Aldrete hit what proved to be the game-winner. Russo pitched the last four innings, allowing no runs on just one hit and striking out two to get the win. Curtis McCombs (Louisville) started and took the loss for the Redbirds, allowing all four Big Train runs on five hits and a walk in 6.1 innings. He struck out three. Earlier in the day, the Redbirds cruised past the Southern Maryland Nationals, 10-1, in a game that was called in the eighth inning due to severe heat. John Roberts (Armstrong Atlantic) drove in four runs, and Frank Florio (Tulane) added two doubles and two RBI for the Redbirds. Tyler Spurlin (Rice) pitched seven shutout innings, allowing just three hits and a walk while striking out six batters to get the win. Nick Sydnor (Concord) had two hits for the Nationals. Notes: The first-pitch was moved to 8 p.m. to allow the temperature to drop (it didn’t by much)... the attendance for the Championship Game was 622... The Big Train was ranked #3 nationally by Perfect Game USA this week... Six players on the Redbirds roster have played on the team all three years that they faced Bethesda in the finals of the League Championship Series (Frederick, Jensen, Winter, Florio, Carey, and Steve Visnic (Temple))... Big Train manager Sal Colangelo is the longest tenured coach in the Cal Ripken League.